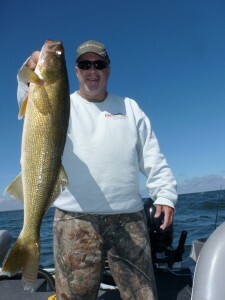 Walleye fishing has been very good on Green Bay with both big trophy sized fish and numbers being caught in my boat. I have been targeting deep water 22 to 35 fow. 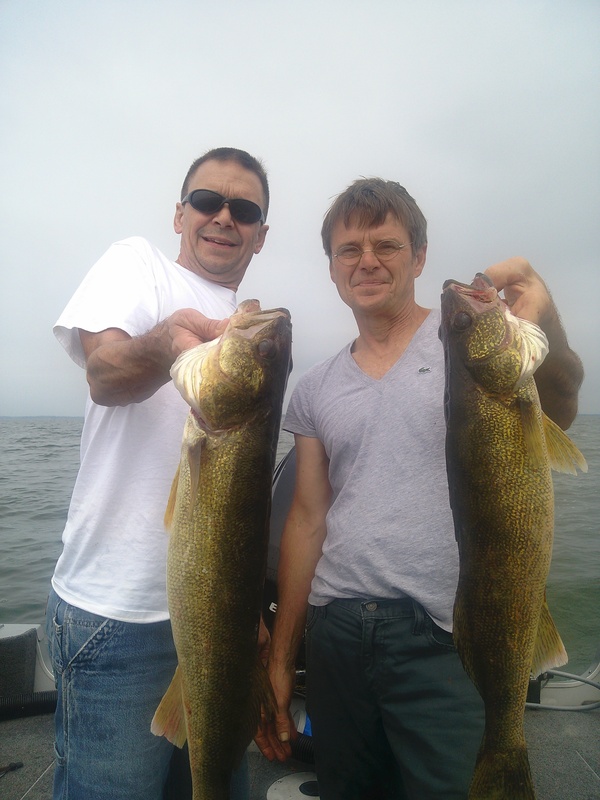 I am using night crawler harnesses and crank baits ( larger profiles) Reef runners, deep tail dancers often run with a 1 ounce snap weight to dive deeper. 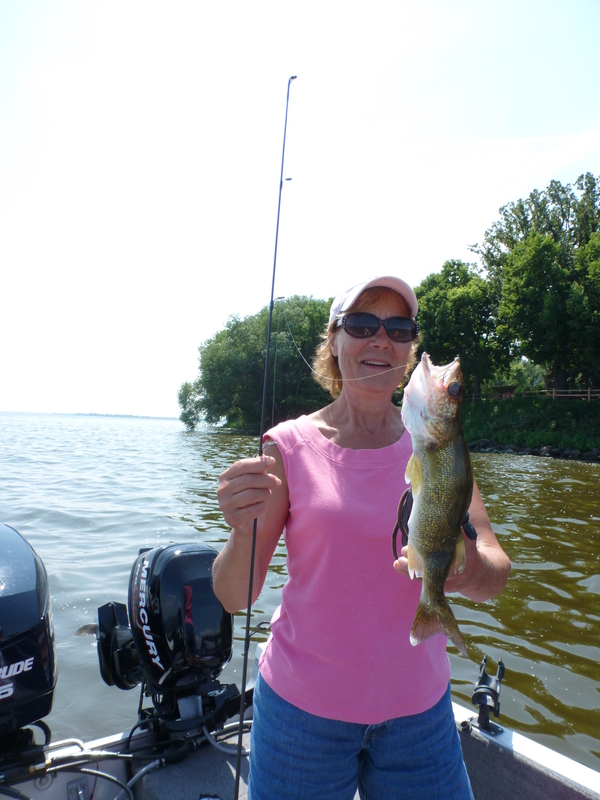 There still is a lot of bait fish that the walleyes have available and at times it is work to get the fish to bite! But when you do some dandy trophy walleyes have been caught. 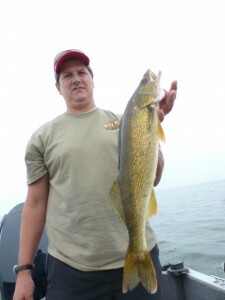 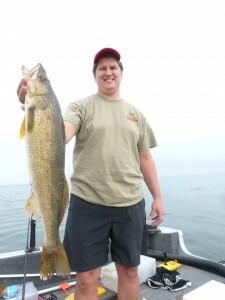 Any walleyes larger than 22 inches goes back. 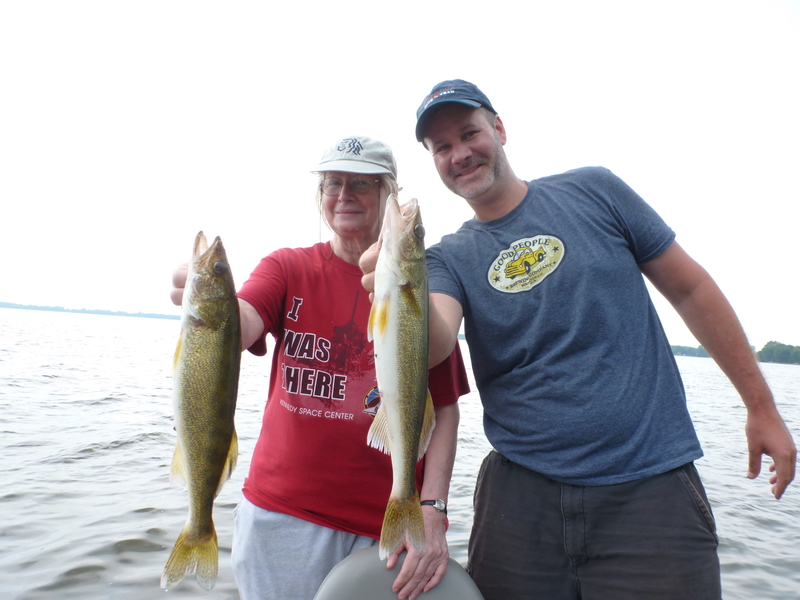 CPR’d -caught , photographed and released . 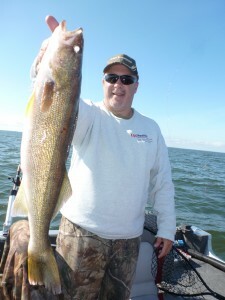 I have some openings, this week, join me for a day. I can partner you up with other anglers in you are alone. 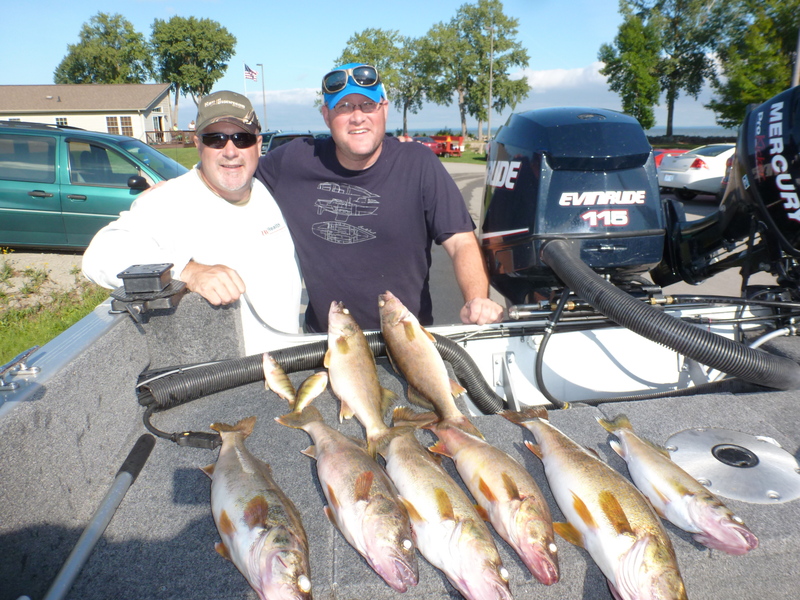 Get on this bite and join me on Green Bay or Lake Winnebago! 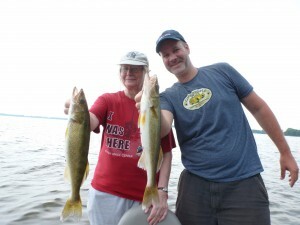 This entry was posted in Uncategorized on August 23, 2014 by Jim Kleist. 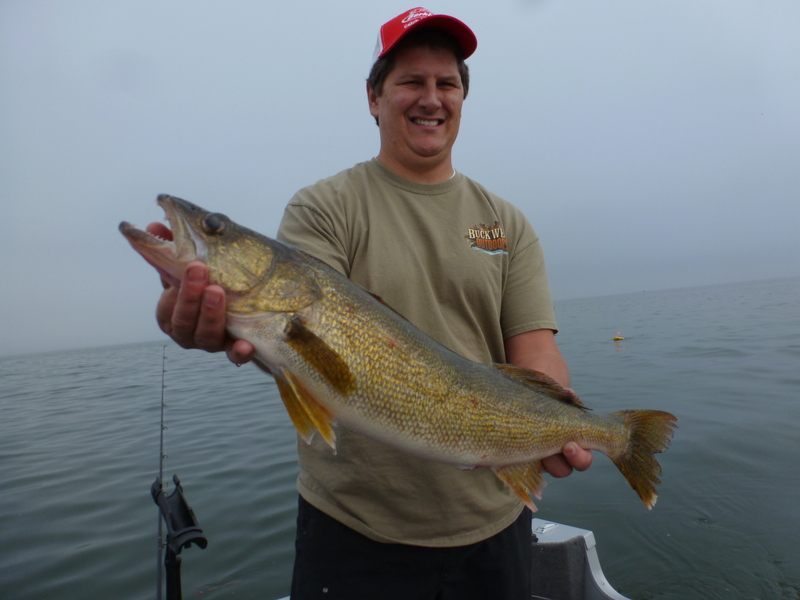 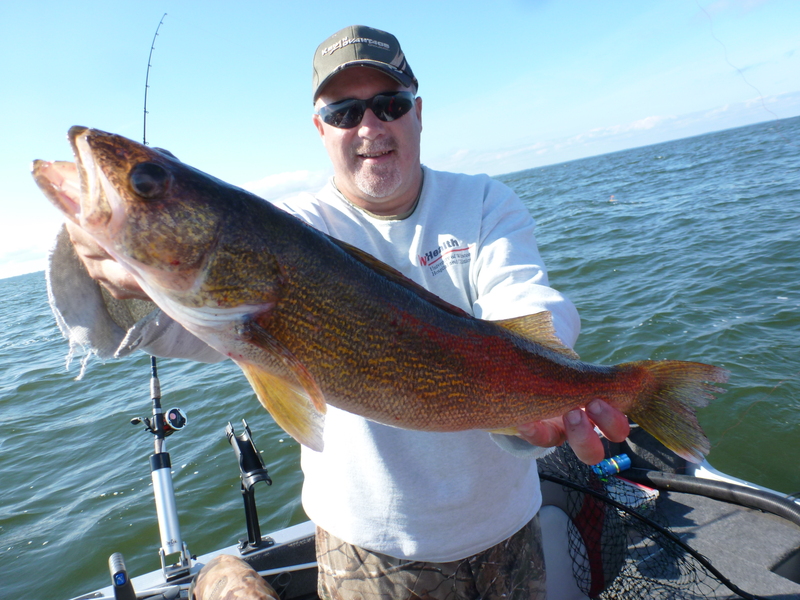 Walleye fishing is still productive but there is a huge forage base available to walleyes in the system. 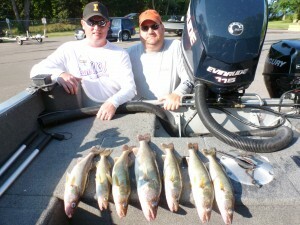 I have observed massive schools of 2 – 3 inch minnows. 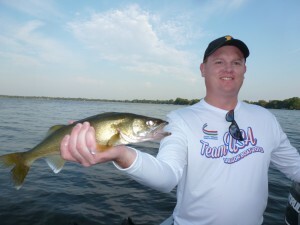 10 x 30 feet long with white bass, and walleyes gobbling them up! 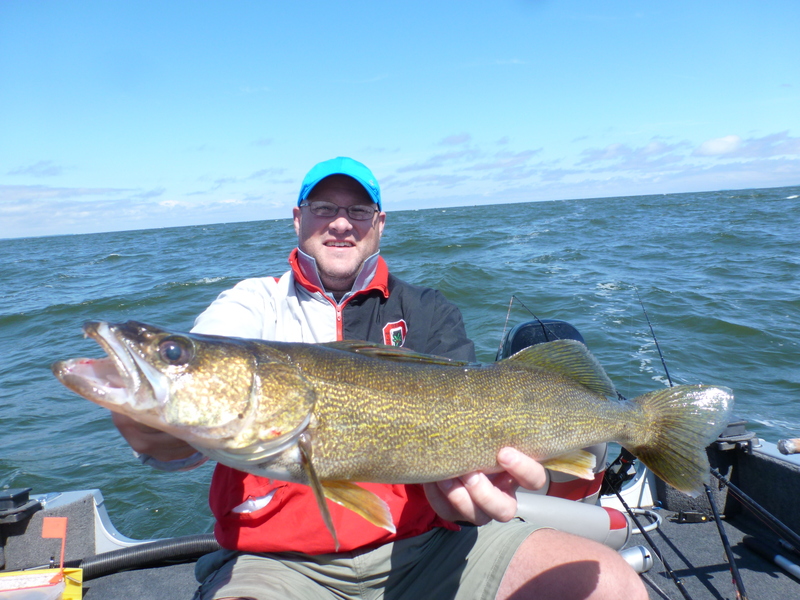 Yesterday was flat calm day which adds another degree of difficulty but we managed 7 really nice walleyes fishing with George and Andy for Faith Technologies. 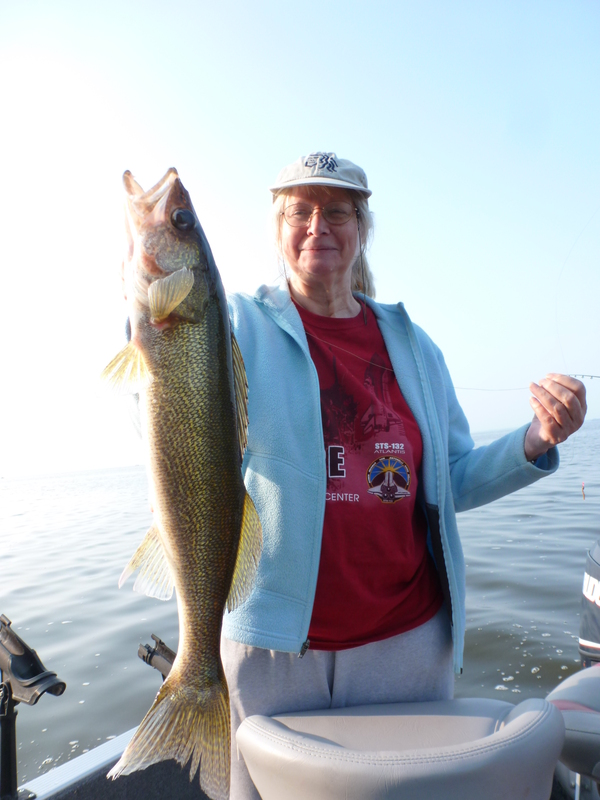 We lost and released some walleyes. 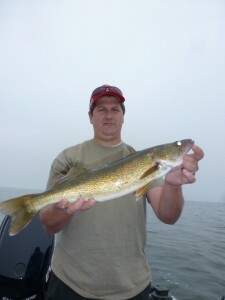 Each day out I have been catching some 22 inch or bigger fish and some real nice eaters as well. Earlier in the week the wind and water- calmness or “flatness”was the same. 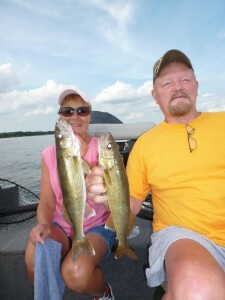 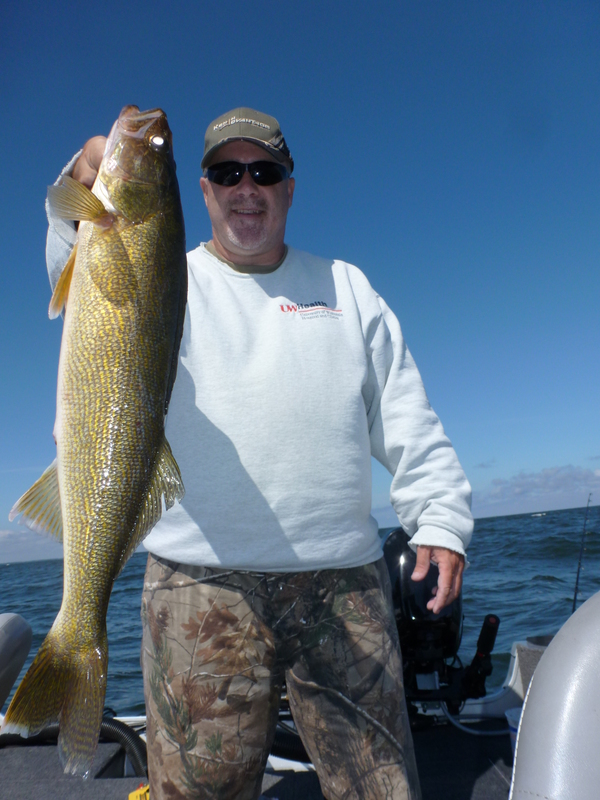 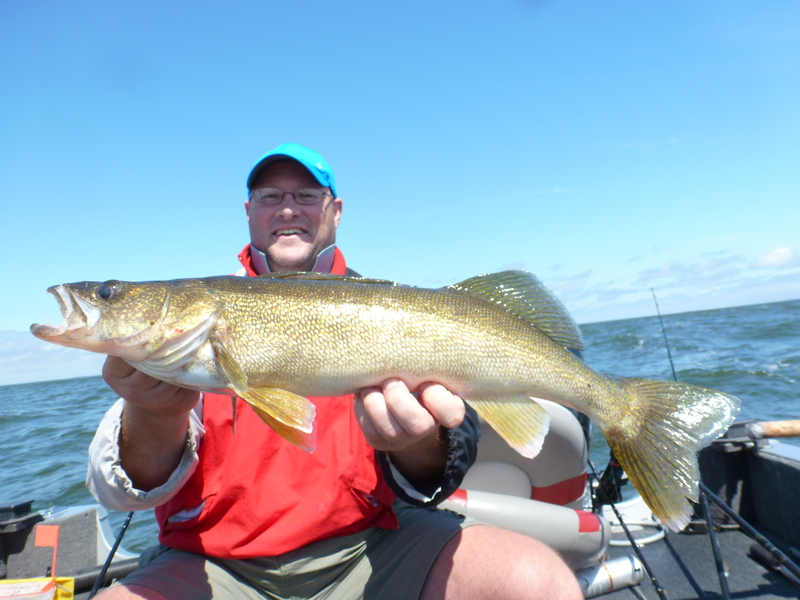 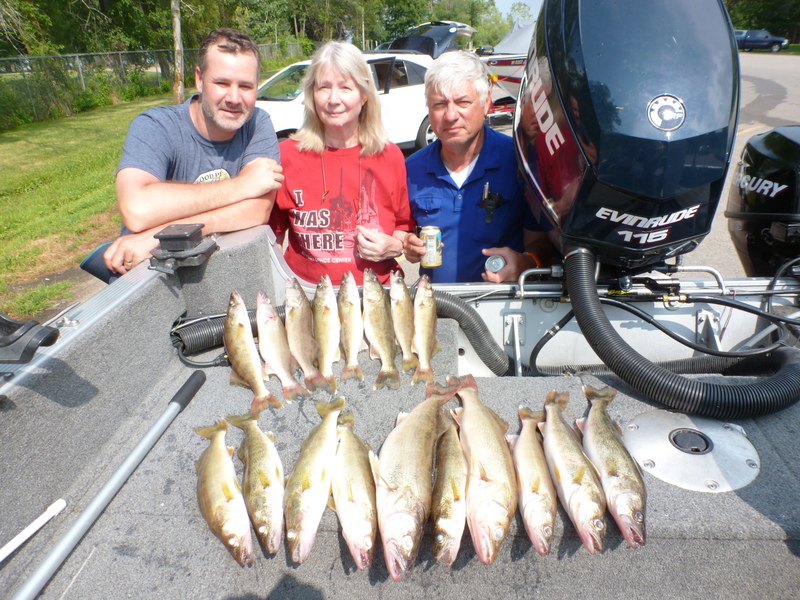 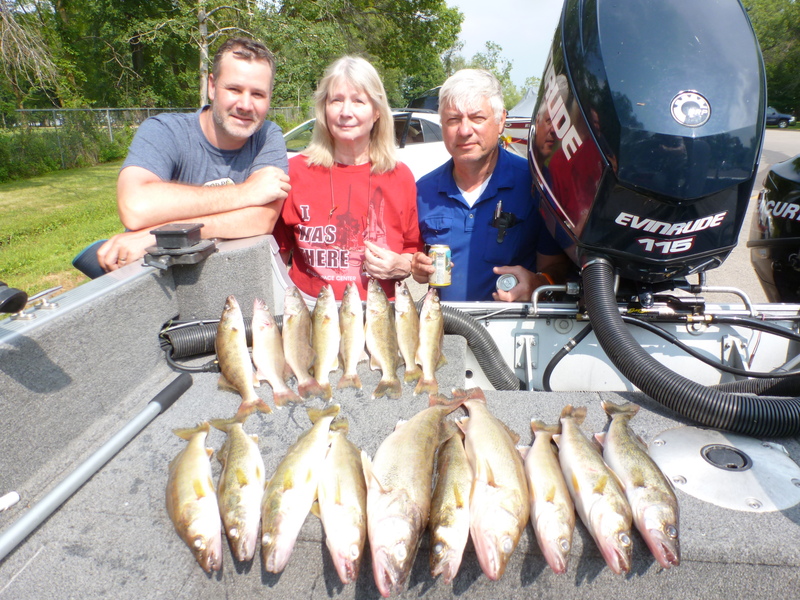 However with some hard work Gary and Terri caught some very nice fish as well– a nice one man limit of walleyes. Finesses fishing and no trolling! 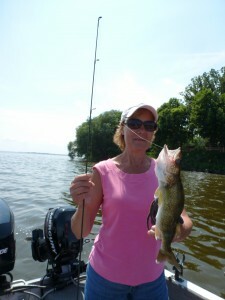 Fishing with jigs and very small storm crank baits -baby storms in a perch pattern. 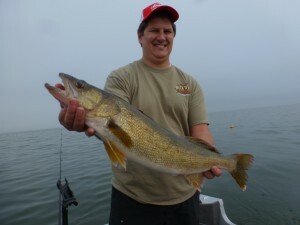 The mornings seem the best time to for a good bite! This entry was posted in Uncategorized on August 9, 2014 by Jim Kleist. 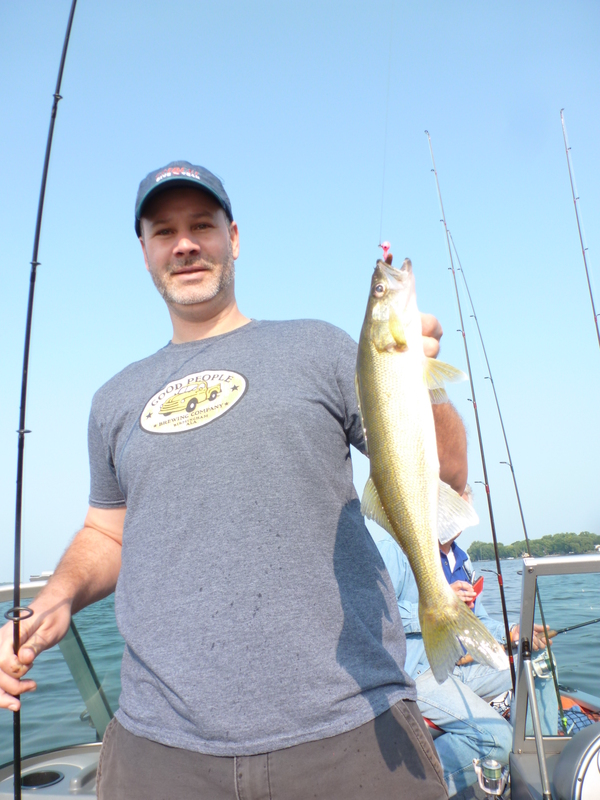 Excellent walleye bite on Lake Winnebago today. Walleyes were selective. 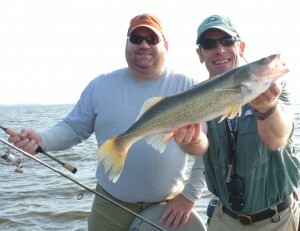 Managed almost a 4 man limit of really nice walleyes. 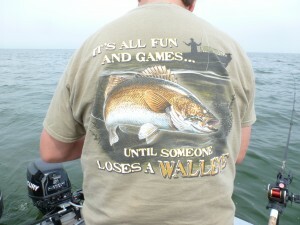 No trolling. 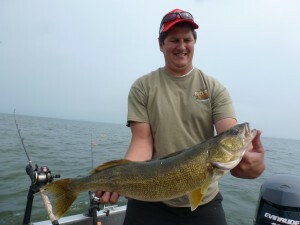 Jigging and crank banks. 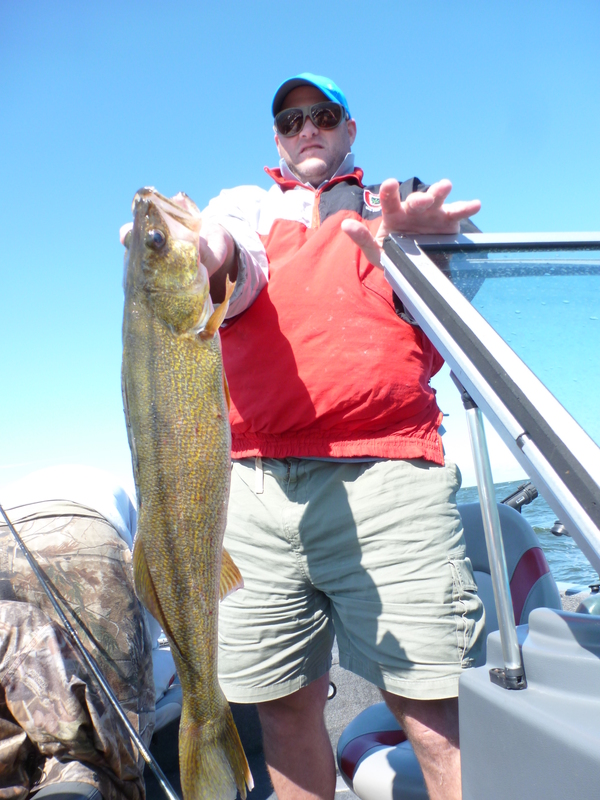 The wind died down and a aggressive presentation got walleyes strikes. 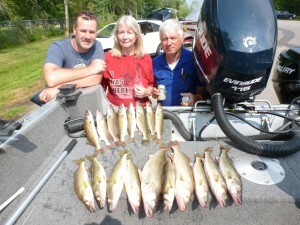 We boated over 20 fish 17 – 23 inches. Pink was just awesome today in 1/8 Oz. 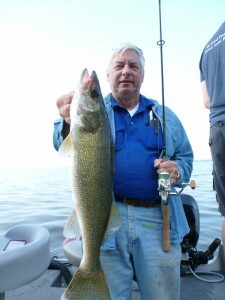 Not everybody can catch fish this way. 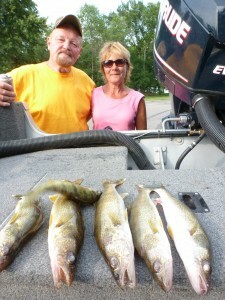 But I was fortunate to fish with Lois ( caught the most) followed my Jessie and then Gary. 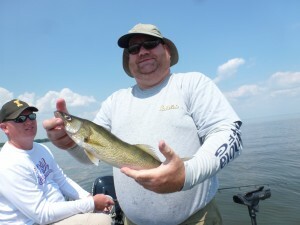 It amazes me how even in my boat one person dominates and it isn’t always the guide! 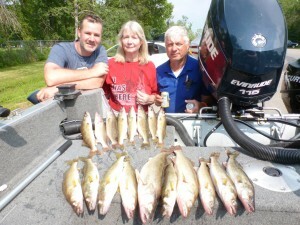 One of the best days of the year ! 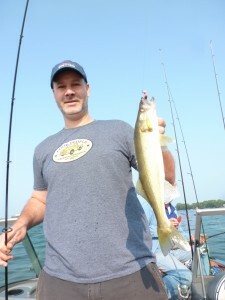 July 31, and flat dead calm water. If you want to spend a day on the water $200 P.P. 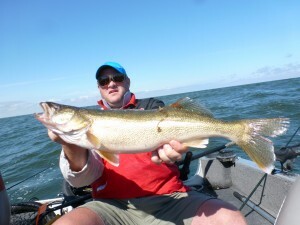 Book now or for next season. 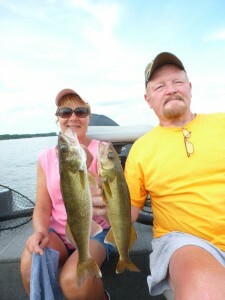 I can partner you up if you are alone too. Green Bay giant walleyes are going to be targeted heavy now too. 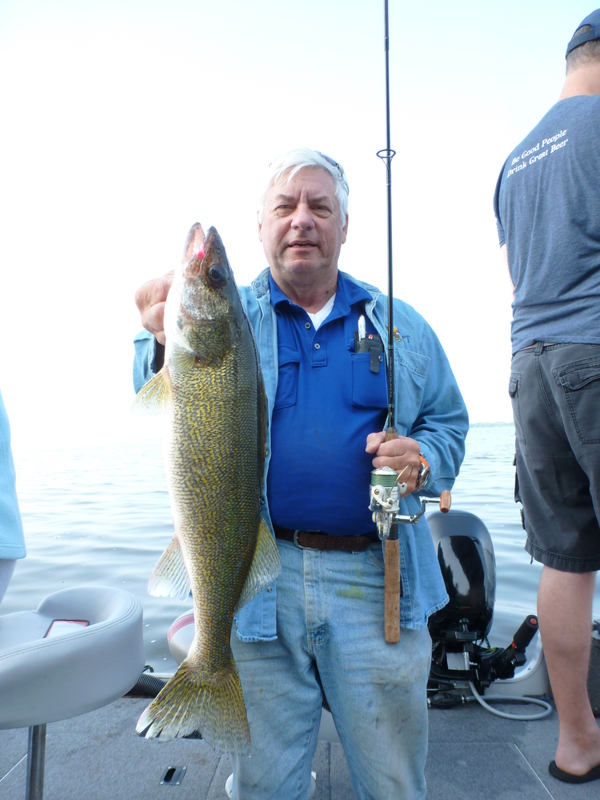 This entry was posted in Uncategorized on August 1, 2014 by Jim Kleist.